My final day in Chengdu – Dumplings and tea? On the way back from Juizhaigou, in a heated food discussion, Leon told me about these amazing volcano dumplings that I just had to try. We meet at noon, seedy, with the perfect hangover for consuming dumplings. Leon takes me to this small open chinese eatery and orders 24 dumplings which were just steamed dough stuffed with spicy rice, heavy but very tasty. We can only eat 6 in total, and I was impressed with Leon’s serious miscalculation of how much he thought I was going to eat. 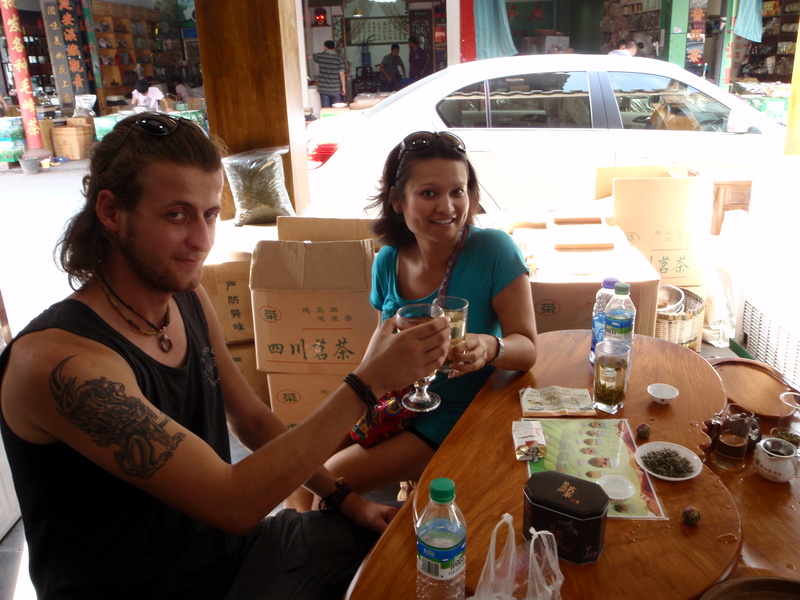 Leon decides to accompany me to the Tea markets where I was on a quest to find this special flower blooming tea. As we sit at the tea tasting table, the tea serving ladies are asking Leon all sorts of questions, and it wasn’t only because he could speak enough chinese to get by, but also because he was tall, blond, and easy on the eyes. The lady ignores me through the whole tea tasting process addressing all her questions, answers, and smiles to Leon. Leon, the hard-edged guy from Israel, is softened by the amazing flower blooming tea and decides to get ten buds for his Mum. Suddenly, our serving lady turns and looks at me for the first time, then smiles to me that brilliant smile that had only favoured Leon in the last 20 minutes. It was all the encouragement I needed to walk out of there with more tea than anyone about to spend 2 months in India really needs to have. Lesson – Money does buy happiness.